Your initial Core-22 purchase will give you lifetime access to your dashboard so you can come back to the program anytime you need it. Core coaches are available behind the app to answer questions and help guide your weight loss journey. Core includes four distinct whole food plans that are customized to your individual specifications based on your intake. Enlist the support of friends, colleagues, and professionals to follow your progress through the app to promote accountability. Create or a join a group of like-minded individuals to share recipes, encouragement, and wisdom. Your first month's supplement order is included in the price of the diet although we encourage you to continue with a monthly subscription. What are the 22 principles? These are the principles that make the difference between success and failure. We studied every source we could find to determine every factor that could play a role in the weight loss process. We were amazed to find how few were offered in the most popular diets and how many were never mentioned. These principles are so powerful. Learning them not only makes weight loss possible, but it also makes any goal you set more attainable. I have a health condition. Can I still use your program to lose weight? The standard answer is “Ask your doctor.” This diet is based on learning the principles that determine your weight, eating healthy food and avoiding food that contains toxins or lack nutritional value. We focus on making sure our dieters get adequate nutrients, sleep, and water while getting the support necessary to successfully reach and maintain their weight loss goals. We include all natural safe food based supplements without stimulants or synthetic ingredients. We've seen dieters with many health conditions not only achieve permanent weight loss but also drastically improve their health. If you are allergic to a specific food and see that it was a nutrient source of one of our products, consult your physician as to whether or not you can still take that particular product. Can I do the diet if I am pregnant or nursing? You should download the Share Core-22 with Your Physician document and ask your obstetrician this question. Tell him or her the diet is based on eating non-processed foods with healthy proportions of fruits, vegetables, and lean proteins. You will also supplement your diet with the highest quality food based supplements available to ensure you are getting the USDA recommended amounts of vitamins and minerals. What will I eat while on the diet? We will give you a list of approved foods, drinks, and seasonings. The food we recommend is unprocessed, with the highest nutritional value and fewest calories. We encourage you to eat organic foods and avoid food that has been genetically modified. You will be eating a variety of fruits, vegetables, lean meats, and seafood that you purchase and prepare yourself. For those of you who don't cook, we have cooking videos that show you how. Does this program work if I only need to lose a few pounds? Yes, especially since that last 10 pounds is the most difficult. To lose that last few pounds you need to know how to apply all the principles and once you lose it, you need to know how to keep from gaining it back. You will learn how to make better food choices, portion control, and how to reduce hunger and craving. The twenty-two principles will get you there and ensure you never need another diet again. Will taking medication interfere with the weight loss? We have had many dieters go through the program while taking medication. Medication will often contribute to weight gain and make it harder to lose weight so it may can your progress and make it more difficult to lose weight. This diet is your best chance of losing weight if that's the case. And because you will likely eat healthier food than at any time in your life, our diet rarely if ever interferes with medication. You should download the Share Core-22 with Your Physician document and check with your physician prior to starting of the program to be sure. If you have ever worked out in a gym with friends? You may have wanted to skip a day and your friends would not have it. That's social support. Once you knew they would hold you accountable, you were more likely to make each workout. We ask you to do the same with your diet. You simply click a button to send friends and family an email or text to ask that they support your efforts. They opt in by clicking a link that allows us to send them an email or text once a week letting them know how you are doing. They never see your weight, but rather how much you lost and how many days you have left to reach your ideal weight. You can have as many supporters as you have friends and family. We found a direct correlation between the number of people following a dieters progress and their chances and speed of success. This is a significant function of our site. You log in each day to enter your weight and check a list to determine what you did and did not do that you should have during the prior 24 hours. This teaches you the effects of following or violating the different principles. It allows you to learn what will happen with each thing you do right or wrong and makes it possible to predict your weight each morning. When you can do that, you will be able to make decisions knowing the impact each will have on your weight. I'm on high blood pressure medication. Can I do this program? Yes. Like dieters on diabetes medication, you may find your dependence on medication declines as you progress through the program. Your body will begin to function better than it has in a long time. As it does, your doctor may ask you to reduce or stop your medication altogether. Don't modify your medications on your own. It would be a good idea to take your Blood Pressure weekly and see your doctor if you need to adjust your dosage. How will this program affect my cholesterol levels or cholesterol medication? Most dieters with high cholesterol at the onset of the program report a drastic improvement in their levels after learning to eat better foods. We suspect the change is likely due to the combination of foods high in nutrients and the whole food supplements. Getting enough nutrients allows the body to start working as it was designed to and this corrects the faulty cholesterol metabolism. There is no adverse effects at all but don't be surprised if the next time you have your levels checked you see an improvement. I have diabetes. Can I do this program? Yes. You will be eating a healthy diet of foods with a low glycemic (sugar) index and that is perfect for dieters with diabetes. Our dieters with diabetes do very well and often have to lower or come off of their medications as they lose weight. We have had a number of people that no longer take insulin as a result of the program. How important are the supplements if all I want to do is lose weight? Unlike the majority of supplements sold today that are synthesized in a factory like, the supplements we use come from fruits, vegetables, and wild caught fish. They were carefully selected to ensure that when combined with nutrient-rich food, you have all the nutrients needed to burn more calories, reduce chronic hunger, and allow for optimum cell function. This is why the diet is so healthy and easy to follow. It's also the primary reason why dieters lose weight so fast and find it easy to keep the weight off. Do I have to take the supplements? Yes. Food today does not meet the average person's nutritional needs and without the right supplements in the correct combinations, your body just can't function at its fullest. Nutrient deficiencies slow down calorie-burning, metabolism and have devastating repercussions on one's health. Not just any supplement will do either. Most supplements are synthetic, meaning they are manufactured from crude oil. Synthetic supplements impact specific health conditions but they can't make up for the nutrients you are not getting from your diet, no matter how well you eat. Getting real nutrients in the right combinations and quantities is vital because weight loss is only possible if you can lower your calorie intake while continuing to supply your cells with the nutrients they need for healthy metabolism. Almost all dieters violate this formula the second they lower their food intake to lose weight without adequately supplementing their diet. Without adequate quantities of certain naturally sourced nutrients, cutting calories will cause intense cravings and slow down metabolism, making it almost impossible to lose weight and keep it off. Will I have to take supplements after I reach my target weight? Even if you eat a perfect diet, you can't get the nutrients needed to keep your body functioning at its best. The word supplement came about as a result of a large-scale government study that showed a gap between the nutrients needed to avoid disease and what was possible to get from food. The difference between these two is what needs supplementing. We at Core know that your goal is not just to avoid illness, its to have a fully functioning metabolism for maximum calorie burning, to get the most from the food you eat and are full of energy and life. For that reason, we have gone way above the minimum daily recommendations. The supplements we recommend are made from food. You wouldn't stop eating food after reaching your goal nor would you stop supplementing your diet. The purpose of food is to supply the nutrients our body needs to function. We need to supplement because we can't get all the nutrients we need from food alone. Nutrients help you maintain optimum health and the highest energy levels possible. Yes, you should continue taking supplements. The supplements you will take while losing weight are the absolute best and most comprehensive we could create. Because they are whole-food supplements, they are much more expensive than synthetic, man made supplements and may be too expensive for you to take forever or for the entire family to afford. With that in mind, we created an all-around supplement for you and the entire family. These are the supplements Dr. Schmitt and his family takes daily. Can I take my own supplements instead of the supplements you recommend? 99% of supplements are synthetic or man-made. They have a fraction of the nutrients that occur in nature. Synthetic supplements will not provide all the variety and quantity of nutrients you need to reduce hunger, craving, and to boost metabolism. If you are taking whole food supplements, keep taking them. There are no adverse effects when taking more than needed. However, the chances you are taking the best combination of whole food supplements for the weight loss is unlikely. Our experience has taught us that you lower your chances of success dramatically if you don't follow the program as we designed it. We went through 17 different trials with different supplement combinations prior to deciding on the supplements we use now. Once you reach your target weight, your supplements may be enough to keep the weight off but we know the combination recommended with the program will work best. I have had trouble taking supplements in the past. Are your supplements any different? Yes. More than 99% of all supplements sold are synthetic. They are typically one version of one or more particular vitamins. In food, vitamins have many versions or structural configurations that work together like the instruments of a symphony. Alone, they can cause a number of issues including upset stomach, nausea, gas, headaches, and worse. However together in their natural variations and combinations that are only found in a whole food based supplement, they provide the millions of cells of the body with what they need to function at their peak. When your body has the materials it needs, it works. Our supplements combined with good food allow that to happen. I was told I can't lose weight because my thyroid and metabolism are slow. Will this prevent me from losing weight on this program? Not at all. We have been told that by so many dieters. They respond just as well as anyone else on the program. People with slow metabolism respond to eating nutrient-rich food. When combined with the right supplements, you will get more of the vitamins, minerals, and phytonutrients your body needs to function at an optimal level. Normal metabolism for most of the population is actually slow compared to people on our program because the typical American diet has so few nutrients. Unless your thyroid has been removed or damaged, you should do very well on our program. With our guarantee, you can try it out and if you don't respond, we will refund the cost of the program, minus the cost of supplements. What are the chances I will fail? Very small. This is not like any other diet. As a Dr. and Personal Trainer we could not find a program half as good as this to recommend to our patients or clients and none have the functionality that comes with core-22. 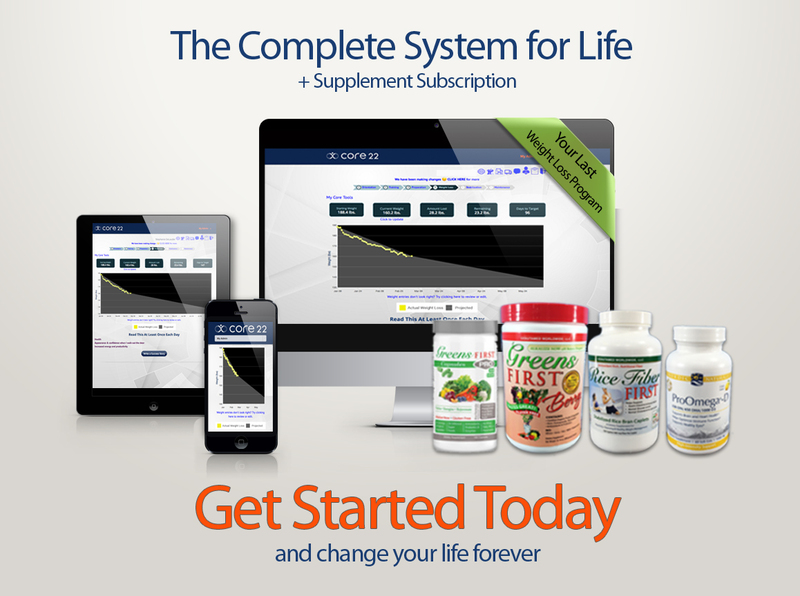 Daily feedback, social support, all 22 principles of weight loss, and our whole food based array of nutrients have never been combined into one weight loss program until now. The only reason you will fail is if you don't try or follow the program as recommended. You may find a principle or two difficult but often times those will be the ones keeping you at the weight you are now. Our daily feedback tool will quickly point out any areas that may be hindering your progress and we've been told that this alone is worth the price of the program. How important is exercise when losing weight? Exercise is one of our twenty-two principles of weight loss. If you add an exercise regimen to your weekly activities you can lose weight faster and keep it off with much less effort. It shapes and tones muscles giving you an appearance of fitness while at the same time improving heart and lung capacity and health. It gives you energy, improves overall health, vitality, and physical appearance. Even though we encourage everyone to exercise if they possibly can, it's not absolutely necessary to losing weight on our program.